Sally! Congrats, Sally, and thanks for entering. Your awesome prizes will be on their way to your mailbox shortly. Enjoy, and thanks again for checking us out at TV Screener.com! 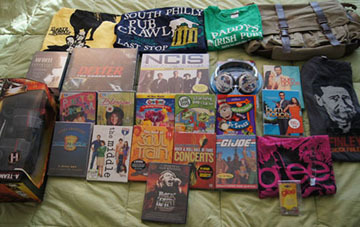 TV-related board games, t-shirts, DVDs, toys and gadgets … we’ve got ’em all in this year’s TVScreener.com Christmas Bag o’ TV Goodies Giveaway, our way of saying thanks for tuning in to TVScreener.com and sharing your TV opinions throughout the year! – $30 iTunes gift cards – perfect for buying episodes of your fave shows, or checking out new ones! Good luck, TV fans, and hope your holiday season has gotten off to a great start! My favorite show this year was Parenthood. My favorite show of 2010 was … Mad Men. This season was pretty good, watching Don Draper pinball himself from one situation to the next with no regard for the people he hurts around him. The topper was him taking the replacement secretary to Disney to look after his kids and then getting engaged to her. Good Job Don! Eastbound and Down… still the best. My favorite this year has been Modern Family… or maybe CougerTown.. or Community. I just started watching it this summer, but I can easily saw my favorite this year has been Breaking Bad. My favorite TV shows this year would have to be Vampire Diaries and The Office! My favorite TV shows this year (you know I can’t pick just one!!) were Teen Mom & Glee. I am still dying to see Modern Family! My favorite TV show this year would be NCIS! My favorite show is American Idol and I still like Survivor. Thank-you for the opportunity to win such great prizes! When it 1st started, I never imagined FRINGE would become the show I’d most look forward to every week. I’m loving The Walking Dead right now! I still have a soft spot for Chuck, but Terriers has been a most pleasant surprise. My favorite show is Parenthood. I am grateful that TV Screener is back after an agonizingly long hiatus. My favorite TV show is Burn Notice, with Psych being a close second! My favorite TV show is Psych. Sean and Gus have the best on-screen chemistry! My favorite shows are It’s Always Sunny in Philadelphia and the Big Bang Theory! Thank you so much for this exciting opportunity! I don’t know if I have a favorite, because it’s a four way tie with Breaking Bad, Modern Family, The Walking Dead, and Boardwalk Empire. I LOVE **The Middle** the actors are wonderful. This comedy is VERY different from any other. My favorite shows are Dexter and The Big C – funny yet powerful series. My faves this year are: Modern Family, 30 Rock, Community, Raising Hope… I could go on! My favorite show is Psych! Modern Family & Cougar Town!